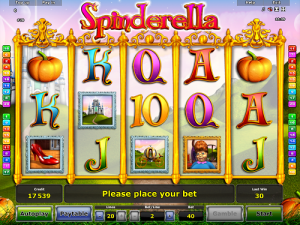 This fairy-tale slot was developed by Novomatic and has the potential to make all of your dreams come true as Spinderella is a generous online slot with an excellent RTP percentage! It has so many bonus features and special symbols, playing it will feel like you’re revealing a magical story full of wins. The background, font and design of this Novomatic slot is sparkly, girly and perfect for fans of Cinderella! It’s also a great game for anyone who enjoys playing other Novomatic slots, like: Lucky Lady’s Charm Deluxe, Mermaid’s Pearl Deluxe and Cindereela. As soon as you load this slot, you’ll feel as if you’ve been transported to a magical land where fairy godmothers exist and you can achieve the wins of your dreams. Just like in the famous Disney cartoon Cinderella, this slot game has been beautifully designed and made – right down to each individual symbol. The symbols are all worth different amounts and some pay more than others. The size of the payouts will vary depending on your bet and you can have a look at the paytable to see exact amounts. The card value symbols pay the least and these are the card values 9, 10, Jack, Queen, King and Ace. Then the higher-paying symbols include the following: the pumpkin, Cinderella’s slipper, the carriage, the royal castle, the prince (Prince Charming) and the princess, Spinderella herself! Spinderella is the Wild symbol and she can substitute for all of the other symbols. A slot wouldn’t be a slot without payouts, now, would it? Well, Spinderella does not disappoint and the payouts in this slot game are positively magical! Whenever you spin three or more identical symbols on one of this slot’s 20 paylines, you’ll get a nice payout! The matching symbols will need to have fallen consecutively on reels from the leftmost one to the right. To get more and bigger payouts, you can choose to bet on all 20 paylines and increase your bet per line by using the plus buttons at the bottom of the screen. There’s an extra special symbol in Spinderella slot game which we haven’t yet mentioned, and that’s the fairy godmother! She is one of the best symbols to spin as she can give you free spins when three or more of her land on the reels! The fairy godmother is the only symbol which Spinderella can’t substitute for because she’s so valuable! When you spin three or more of her (the fairy godmother), she’ll wave her magic wand and transport you to a special set of reels which you can spin to reveal the number of free spins you’ll get – up to 50 of them! – as well as the bonus Wild symbol that will appear on the reels during your free spins! After this, she’ll take you back to the normal reels to play your free spins on, with the extra Wilds symbols added to them. These free spins can give out really big wins! The best thing about the fairy godmother is that when two of her land on the reels and the third just passes another reel, she’ll rewind the reels to put herself back in place to trigger the bonus! Spinderella is a Novomatic slot game, after all, so there’s no surprise to hear that this game has some classic Novomatic casino features! You can gamble your wins in Spinderella for the chance to double them and you can also put the game into ‘autoplay’ mode when you get bored of clicking!